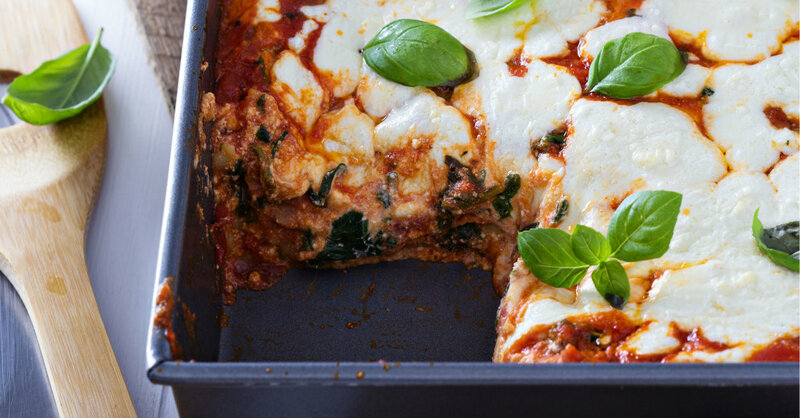 Lasagna is one of our all-time favorite dishes, but did you know you could swap out the noodles for veggies?? While we could never remove pasta from our lives completely, there are some times when we like to let other ingredients shine….. Here, we use thinly sliced eggplant as the pasta, and the rest is exactly like the lasagna we all know and love, with a hearty tomato sauce and tons of cheese. Whether or not you’re trying to eat healthier, this dish tastes amazing, as the eggplant adds a subtle flavor that enhances everything, rather than detracts from it – even the most ardent pasta-lover will love this! Brush both sides of eggplant strips with olive oil and season liberally with salt and pepper. Lay eggplant out on a baking sheet and bake for 5-7 minutes per side. Then, remove from oven and set aside. Lower oven temperature to 400º F.
Start your tomato sauce (if not using store-bought) by heating olive oil in a large Dutch oven over medium-high heat. Sauté onion until softened and translucent, 6-8 minutes. Add garlic and cook for 1-2 minutes, or until fragrant. Pour in crushed and diced tomatoes, then season everything with basil, oregano, red pepper flakes, salt and pepper. Stir everything together, then add spinach. Reduce heat and let sauce simmer for 10-15 minutes. In a medium bowl, whisk ricotta and eggs together, and season with salt and pepper. Spread 1 tablespoon tomato sauce around the bottom of a 9×13-inch baking dish and lay out an even layer of eggplant strips. Take 1/3 tomato sauce and spread it evenly over eggplant, then top with 1/3 ricotta mixture, 1 cup mozzarella and 1/4 cup parmesan cheese. Repeat with a second and third layer, and top everything off with remaining sauce and mozzarella. Cover lasagna with foil and bake for 30-40 minutes, or until cheese is melted and bubbly.